The therapies offered by Advantage Chiropractic Clinic complement your chiropractic care and speed your healing. We’ll start with relieving the pain and work up to maintaining the strength and flexibility you’ll achieve. You don’t have to live in debilitating pain. Whether you have lower back pain, a pinched nerve, sciatica, neck pain, or a variety of symptoms related to damaged or degenerative discs, as well as syndromes of the lumbar and cervical spine, DTS Therapy may be for you. Laser Therapy, or “photobiomodulation”, is the use of specific wavelengths of light (red and near-infrared) to create therapeutic effects. These effects include improved healing time, pain reduction, increased circulation and decreased swelling. Laser Therapy has been widely used in Europe by physical therapists, nurses, and doctors as far back as the 1970’s. 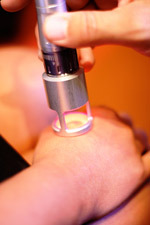 Now, after FDA clearance in 2002, Laser Therapy is being used extensively in the United States. K-Laser is leading the way in pain management, tissue repair, safe treatments, and fast treatment times. In staying on the cutting edge of pain relief, Advantage Chiropractic Clinic is proud to now be able to help manage acute and chronic pain using the PiezoWave. The PiezoWave uses acoustic compression therapy to target areas where your body is experiencing pain. The waves produce a short but intense compression event, effectively providing a deep-tissue massage to the targeted area. Relief of pain, muscle spasms and joint contractures that may be associated with Adhesive capsulitis, Bursitis with slight calcification, Myositis, Soft tissue injuries and Shortened tendons due to past injuries and scar tissues. Relief of sub-chronic and chronic pain and joint contractures resulting from Capsular tightness or Capsular scarring. Start feeling your best! Schedule an appointment at Advantage Chiropractic Clinic today.